However, when you consider the sheer horsepower of the new A12 Bionic processor paired with a better camera system, the improved guts should let me handle my day-to-day phoning with a little bit more ease. On top of that, some tweaks to the original iPhone X design also promise to make the iPhone XS more durable. Oh, and there’s also the iPhone XS Max which is the basically the exact same phone as the iPhone XS, except it’s bigger and more expensive (prices start at $1,100). This all amounts to a pretty boring iPhone update. It’s an “S” year, so we should have expected some spec bumps and small tweaks. The thing is, if you’re someone who likes to keep your device for more than a year or two, the iPhone XS is damn fine investment. If you’re upgrading from an iPhone 7 or 8, the iPhone XS will feel like a revelation. If you already own an iPhone X, well, you already own a great phone. The iPhone XS is better, and I’ll bet you a buffalo head nickel it will have a longer lifespan. That’s what I’m most excited about. A few years ago, former Gizmodo editor Brian Barrett wrote a post about how iPads are forever. Apple wasn’t selling as many as it used to, because Apple had made the iPad so good that people didn’t need to upgrade. And now I wonder if that’s what’s happening with the iPhone. The devices are more expensive, but they also seem more lasting. 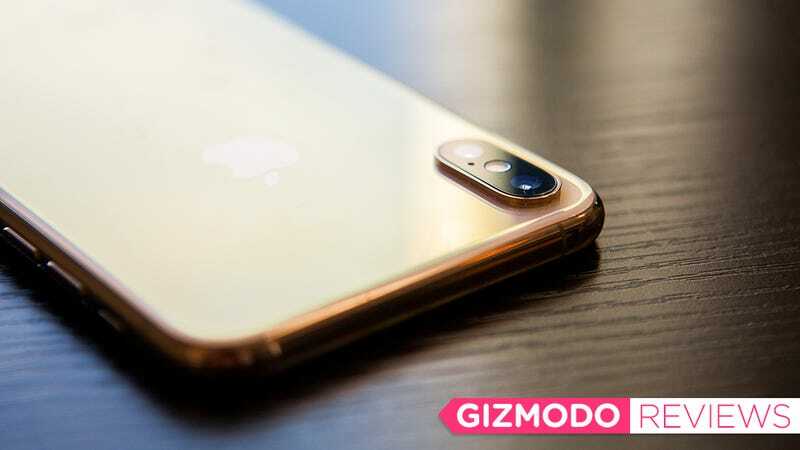 Is the iPhone XS the first iPhone you’ll want to keep for five years? I think it is. Following tradition, Apple didn’t change much about the design of the iPhone XS. It looks like an iPhone X! However, there are a few seemingly minor differences that make it a better device. Let’s start with the size. Again, the iPhone XS is just like the iPhone X. Both devices have a 5.8-inch OLED display and are 7.7mm-thick. That’s slightly thicker than the iPhone 7, which is 7.1mm-thick, and the iPhone 8, which is 7.3mm-thick. Like the iPhone X, the iPhone XS footprint is slightly taller and slightly wider than an iPhone 8. For the iPhone XS Max, all those numbers edge up. 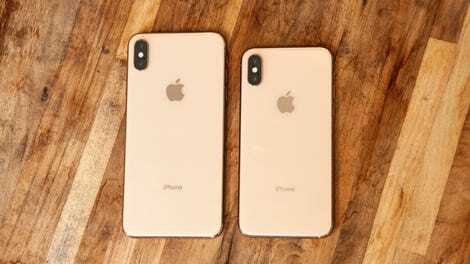 The device itself is almost exactly the same size as an iPhone 8 Plus, but the iPhone XS Max is a full ounce heavier than the Plus at 7.34 ounces. So the Max is big, but if you’ve been using a Plus, it won’t feel much different in your hand or take up more room in your pocket. The 6.4-inch display will feel expansive, though. Using it feels a little different, too, because Apple simply stretched iOS out to fit the bigger canvas. In other words, you’re seeing what you would normally see on a Plus screen except it’s stretched out. While you can’t necessarily see it like you see a difference in size, the iPhone XS glass is new. Apple says the device has the “most durable glass ever on a smartphone.” This is an interesting claim, especially since a ton of people said that the iPhone X was “Apple’s most fragile handset ever.” We didn’t do any drop or scratch tests with the new device, and the reports from those that did seem mixed, so far. However, as someone who babied an iPhone X for a year but still ended up with a screen full of scratches and a network of cracks on the back glass, any improvements to the device’s durability are very welcome. Another difference that you can see is the addition of two new antenna lines. That’s because the iPhone XS includes 4x4 MIMO technology for faster LTE transmission. (The iPhone X and iPhone 8 had 2x2 MIMO.) The iPhone XS also supports QAM and LAA radio technologies for better connectivity. What this alphabet soup of standards adds up to is zippier uploads and downloads. In our tests, the iPhone XS smoked the iPhone X, delivering speeds that were two- to three-times faster on the Verizon network. As it’s an “S” iPhone, the iPhone XS is all about the guts. What I found particularly interesting, however, is that the improvements inside the iPhone XS aren’t necessarily obvious. This is certainly true of the processor, which seems like it’s designed to be extremely powerful and support apps that have not yet been built. I also think it’s partially true for the camera, because you might have to learn new ways to take photos in order to appreciate some of the coolest features. But before we dive too deep into those two things—which are the headline upgrades on the iPhone XS—a quick note about Face ID. The Face ID hardware is the same, but Apple says it tweaked the algorithms to make it faster. And indeed, it is faster. This was actually the first thing I noticed when I started testing the iPhone XS. It seemed to unlock immediately, and I loved it, because it always felt like I needed to stare at the iPhone X for a couple seconds before it unlocked. In a side-by-side test, the iPhone XS unlocks a full beat faster than the iPhone X. I guess over the course of my life, those extra seconds add up. Faster is sort of the overarching theme of what the iPhone XS does. Apple says the A12 Bionic’s CPU is up to 15 percent faster than the A11 Bionic, and the GPU is up to 50 percent faster. Our synthetic benchmark tests did show a solid improvement, although our day-to-day testing suggested something even more interesting. The A12 Bionic seems like V12 engine running on six cylinders. Right now, you’re only tapping into a fraction of the chip’s power, and even that feels delightfully powerful compared to earlier iPhones. Star Walk 2 is buttery smooth on the iPhone XS, while it has a tendency to lag on the iPhone X. Fortnite loads about 15 seconds faster on the iPhone XS than on the iPhone X and PlayerUnknown’s Battlegrounds only utilizes half as much of the GPU on the iPhone XS than it does on the iPhone X. That means it should be prepared for a future of better graphics, perhaps one that the developers haven’t even dreamed up yet. Apple’s new A12 Bionic chip feels like more chip than I need right now, which is not a bad thing. It seems like it’s designed not only to better handle the apps of right now but also encourage developers to push its limits with the apps of tomorrow. It also does all of this without sacrificing battery life. Both the iPhone XS and the iPhone XS Max performed as advertised with over 11 hours and over 13 hours of video playback, respectively. These all very good things, if you’re like me and thinking about investing $1,000 in a new phone and want that phone to last you a few years. And then there’s that camera module. It’s neither inside nor outside the phone, which is still a little bit annoying if you want your phone to sit flat on a tabletop without a case. But that’s not the point. The iPhone XS camera is better than the iPhone X camera. Central to the better camera system is a bigger sensor. Apple said the wide-angle camera comes with pixels that are 32-percent larger than those on the iPhone X. You really can see what a difference that extra sensor size makes when taking low-light photos, too. This street scene in Brooklyn looks fine in a photo taken with the iPhone X. Taken with the iPhone X. The image has been cropped but not otherwise edited. The details of the road and cars show up under the street lights, but the illuminated restaurant sign behind it is blown out. When you look at the same shot taken with the iPhone XS, there’s simply more there, including the letters on the sign. Taken with the iPhone XS Max. The image has been cropped but not otherwise edited. There’s more to this than a bigger sensor. The A12 Bionic also plays a big role in enabling the camera to capture and process a lot of information very quickly. This is what makes the new Smart HDR feature possible, and I’d argue that we can see the letters on that sign because of Smart HDR, which Apple says combines the best features of several different exposures to increase the dynamic range of photos. Several of us at Gizmodo tested the limits of Smart HDR, and we agreed that it’s good at keeping image highlights from seeming quite so blown out. It won’t rescue photos taken in too much darkness, but it will allow you to see more details when taking images in overly bright environments or taking images that have big blotches of brightness, like our restaurant sign above. The iPhone XS is also just generally better at dealing with highlights and shadows than other iPhones are, but its performance isn’t flawless. This is most obvious in situations with more challenging lighting, like the backlit building with the dinosaur painting below. This is a tricky shot. The photo taken with the iPhone 8 Plus (left) basically shits the bed, blowing out the sky and failing to produce much detail of the brick building. The photo taken with the iPhone X (center) does a better job but looks washed out. The photo taken with the iPhone XS Max (right) reproduces textures on the building in a very realistic way, although it does lose some of the details in the bright clouds. It’s the best photo out of the three, but it’s still not perfect. Another tough situation that the iPhone XS handles well is very high contrast images, especially those with extreme bright spots like the reflections in the photos below. Check out this image of a shining copper still. Its textured exterior is a big part of what makes it interesting, but the photo taken with the iPhone X fails to preserve that texture. It’s just blown out in certain spots. Look at all those bright spots. Honestly, most of the photos I took with the iPhone XS look good. Which is to say, the camera is definitely good enough for most people. The new Portrait Mode and its adjustable depth of field is especially great. This feature allows you to adjust the look of the bokeh in Portrait Mode shots, after they’ve been captured. You can make the background behind the focal point completely crisp or you can make it super blurry using a new little slider that’s labelled with f-stops in the Camera app’s edit mode. You’re not actually changing the f-stop, since it’s a software trick. Nevertheless, it gives you some more flexibility with photo editing. The effect looks a little fake if you overdo it, in my opinion, but it’s something I like about the new camera. Adjusting the f-stop allows you to save portrait images that might otherwise be too aggressively blurred. From left to right: f-stop 1.4, f-stop 4, f-stop 5.6. Portrait Mode is better in general. In the past, I’ve typically dealt with a lot of weird artifacts and glitches with Portrait Mode in the past, usually to do with some shortcoming in distinguishing the subject of the portrait from the background. It’s hard to say how better the iPhone XS at dealing with these challenges, but the fact that you can now adjust the bokeh effect is a useful tool in this respect. For example, if the edges of a subject in a Portrait Mode photo look too blurry or even just not quite right, the magical little slider can tone down the bokeh effect and make the image look more realistic. It’s also handy if you simply want some options for tweaking these kinds of photos, options that simply do not exist with other iPhones. The f-stop slider feature is not available when trying to edit Portrait Mode photos on older iPhone models. Oh, and if you’re hungry for more examples of what the iPhone XS can do, here’s a whole gallery of them. All of these photos are unedited except for some basic cropping. Let me be blunt with you. I want to buy the iPhone XS, but I’m not sure that I will right now. At the very least, I’m going to wait a few weeks to read more about the durability issues and to test out the iPhone XR. But it feels like I want to buy an iPhone XS and then not even think about buying an iPhone until after the 2020 presidential elections. That’s because the promise of longevity is what make the iPhone XS feel special. There’s nothing new about the design, which is fine with me because the design is terrific. Performance-wise, the iPhone XS is just marginally better than the iPhone X. It is tremendously better than the iPhone 8 or the iPhone 7, however, the iPhone XS also promises to remain excellent for several years to come. At least that’s how it feels. A couple weeks ago, I wrote a blog about which iPhone XS you should buy and recommended the 256GB iPhone XS in space grey on Verizon. My review unit was the exact same model except it came in the new gold color. I liked the gold! And I’d also stand behind my original recommendation. The smaller iPhone XS with the mid-range storage is probably the best phone for most people. It’s the one I’ll buy, if I finally decide to buy one. And if you really want the jumbo dude, go ahead and get the iPhone XS Max. I hope you love it. The fact of the matter is that I want to love this new iPhone. I want to spend years of my life with this new iPhone. I want this new iPhone to last forever. Because wouldn’t that be the best? You spend a grand on one phone, and you don’t have to spend any more grands again. That’s not going to happen any time soon, but at least, the iPhone XS feels like it will stick around. Feels like it will be years before we see what the A12 Bionic chip can do. Camera performance is marginally better than the iPhone X. Smart HDR and adjustable bokeh are awesome features you can’t get on any other phone. New antennas make wireless much faster. Faster Face ID makes unlocking the phone even more effortless. $1,000 and up is a serious price point, but you might be able to hold on to this device for years to come.